Directed by Ron Howard. Starring Jennifer Connelly and Winona Ryder. Music by Hans Zimmer (....and his pal). There's some pedigree in that line-up. 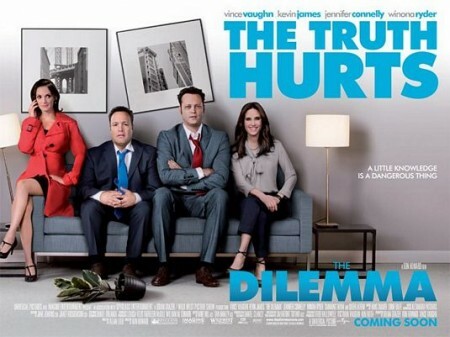 Sure, the rest of the cast hardly inspired a great deal of confidence and writer Allan Loeb's career has been more steady than spectacular but there was hope that 'The Dilemma' might be a passable comedy drama conflab. And despite the wave of critical derision, I think it could just about be described as such. But with some controversy along the way. The film focusses on two couples: Ronny (Vaughn) and Beth (Connelly), and Geneva (Ryder) and Nick (James). Ronny and Nick and best pals and business partners, working together on a big deal with a car manufacturer. Things are looking good. Until Ronny spots Geneva smooching with Channing Tatum's tattoed rocker Zip. Yep, you read that right. So herein lies "the dilemma": should Ronny tell his best pal Nick about his wife's playing away? Or should he keep quiet in the interests of maintaining Nick's focus on their crucial business deal? Except that's not the actual dilemma. The real dilemma is whether the audience lets the film get away with using the word "gay" as an insulting term. In a pitch to the car manufacturers, Ronny says that electric cars are "gay" but "not homosexual gay", before proceeding to show photos of a bunny and a kitten in a slideshow as a visual representation of what they mean. Which is pretty confusing as that says "cutesy" to me more than anything. What's particularly surprising here is that there is ample opportunity for some sort of mild rebuff from any of the multiple characters in the scene. That would have worked perfectly and might have actually made some audience members re-evaluate their use of the word. But it wasn't to be. I suppose there's a qualification in saying that the word isn't meant in a homosexual manner but it wasn't something that was necessary. The filmmakers should know better. Similarly, Queen Latifah's superfluous and crass character, who continually refers to her "lady-wood", is a significant mis-step. Howard and Loeb seem more preoccupied in making the audience uncomfortable, with several other awkward moments, at the expense of appropriate character development and actual jokes. The main characters and plot plod along in an not too unpleasant manner, although it's difficult to root for any of the characters. Mainly because they all seem so stupid. Ronny, as the central protagonist, is strangely most idiotic of them all - for example, he goes to spy on Geneva using a limited edition collector's car as his method of transportation. A master of subtlety, clearly. Not to mention his floundering attempts at maintaining his relationship with Beth. The film's climax sees certain things work out better than others but we're never quite pushed far enough to really care about what happens. We merely end up with an inconsistent but (mostly) watchable relationship drama. With the occasional funny bit. Considering the talent involved though, you can't help but feel somewhat disappointed. 'The Dilemma' is available to watch throughout UK cinemas.